Today, Google celebrated the 135th anniversary of Constantin Brancusi’s birthday. 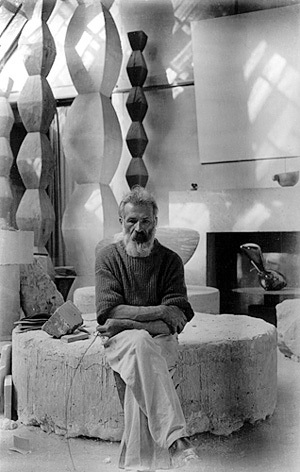 Brancusi created dynamic sculptures inspired by Romanian folk art and imbued with spirituality. I’ve seen his work in galleries and have been taken aback by the stunning simplicity and purity of form displayed in his sculptures. I am as lost in his work as when I see beautiful natural phenomena. Lightning, swallows in flight, Brancusi. Brancusi’s work is surely a definite contrast to today’s manic world, where spirituality is a ne w iPhone app, creation is marketed to death and design is king. With this anniversary, I propose a day of withdrawal from what you see on a daily basis. Go out to the nearest countryside and sit in contemplation of what you see. Leave the fears, ambitions, promotions, advertising, savings, disciplines, rituals. Leave them gasping and scratching back in the flat. And think about this. The beauty of being born in a village, near the Carpathians, the lifestyle there of utmost modesty and plain living, good homely food and wine, led to inspire one of the greatest artists of the 20th century. This entry was posted on Saturday, February 19th, 2011 at 6:49 pm and is filed under Articles, Articles, Honest Publishing Blog. You can follow any responses to this entry through the RSS 2.0 feed. You can skip to the end and leave a response. Pinging is currently not allowed.